NOTE: This is aimed at Year 10, Year 11 and those in sixth form (ages 14-18). This asks some tough questions with some difficult concepts to understand. Here's a picture for you to think about. Click on this image to see a larger image in a new tab. Disclaimer: we have no affiliation with this organisation and inclusion of this link does not mean we agree with their politics or what they say, much of which is antagonistic against Christians, despite stating they value other ideas and the democratic process). Show the 'truth' image on screen. What do you think is true? If what you think is true, how do you know? If you have something you think is true and someone else does that is different (or opposite), who's right? "I am the way, the truth, and the life! Without me, no one can go to the Father." (By the 'Father' he meant God and where God lives, in heaven, a perfect place). Many people say about Jesus that he was mad, bad or that he was right. Jesus didn't leave any room for any other kind of opinion. It makes you make a decision about what you think. So what do you think? The image tells us something about truth. It shows that even when we think something is true, if we have the wrong perspective then what we think isn't true. So if you think the cylinder shape in the middle is a circle, then even if you think the truth is that it's a circle, you are wrong. And if you think the truth that you can see is a square shape, you are also wrong, despite what you think. There is only one truth about what the object in the middle is: the object is a cylinder. It doesn't matter what you think you see and it doesn't matter what you believe. There is only one truth about what the object is. So what? How this does apply to me? First of all, it shows that when we don't have the complete picture or the right perspective, we can get things wrong. Have you ever heard a bit of a conversation and got the wrong idea of what someone is saying? It means you get the wrong perspective. When I worked for the council, someone came in shouting and swearing at me because of a bill they had which said they owed £75. I asked him to let me see the bill. I smiled and handed it back to him saying 'that's not a bill, that's a refund. It's money that we owe you!' He was much happier!! The problem was that he had the wrong perspective. But when we know that people have the wrong perspective or don't have the whole picture, we can be more understanding with them. Secondly, Christians believe that Jesus is the truth and that he is the only way to God. This isn't because they're arrogant or because they hate everyone else. They believe that Jesus is the 'cylinder' truth in the picture. 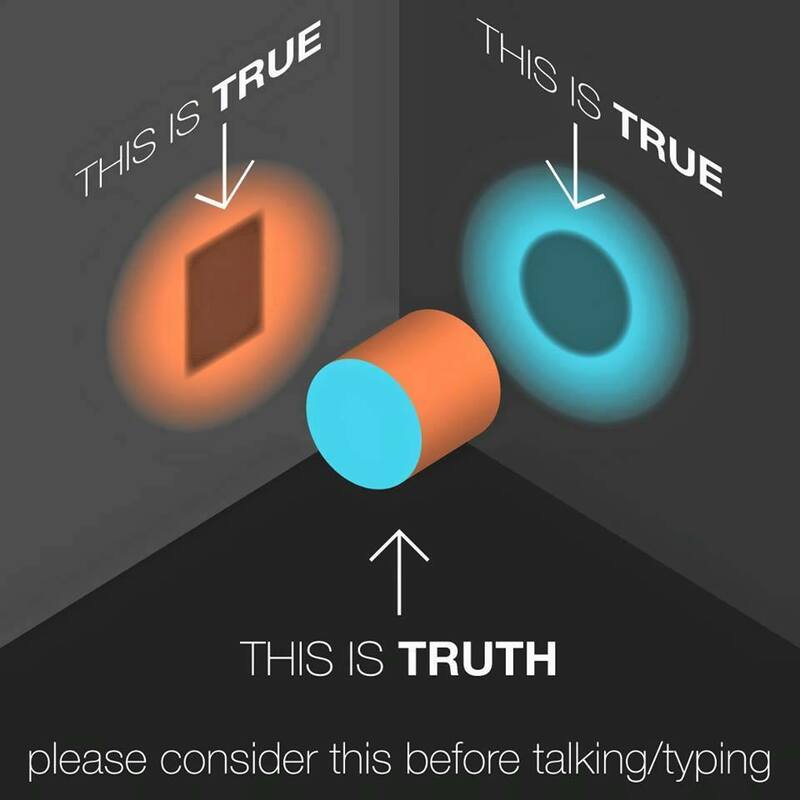 Other people may have a perspective or an angle on what the truth is. Christians just want to say to you, "have you got the full perspective? Could it be the case that what you think is true isn't the real truth." No-one wants to force anything on anyone. In fact you can't, as believing in Jesus can only be a personal choice! But if you found a cure for cancer, you'd want to tell people, right? Or if you saw your child about to put their hand into a fire, you'd stop them for their own good. Or if you saw someone you loved walking off the edge of a cliff, you'd stop them because you loved them. Love wouldn't be to let them walk off the cliff. And that is how Christians feel. We just want you to think about what you believe and why, making sure that what you think is based on reality and not on what other people say. Just because someone thinks something is true, doesn't mean that is true. Just because we may disagree on something, this doesn't make it hateful or hurtful. What is truth? And is Jesus the truth?